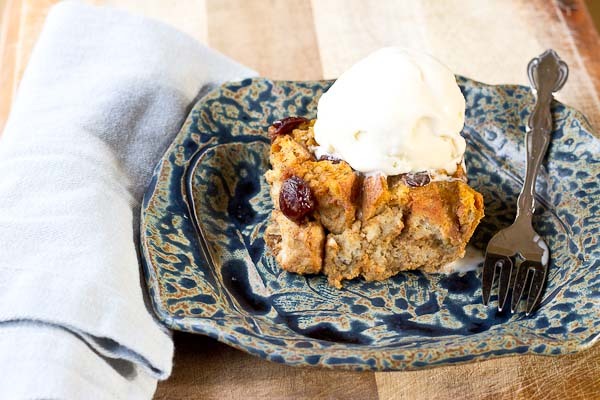 This Pumpkin Bread Pudding with Tart Cherries will warm up your home and fall spirit. Serve a warmed slice a la mode with a scoop of vanilla ice cream for extra decadence. You can thank me later. Thank you to the Cherry Marketing Institute for sponsoring this post. I love the fall season and the flavors that it brings—ahem, pumpkin! But did you know tart is on trend? Sour flavors are exploding in the food scene and Montmorency tart cherries have a unique sour-sweet taste that is sure to satisfy that sweet tooth. 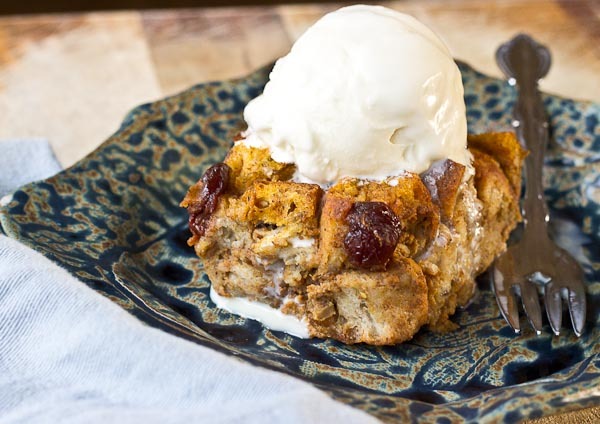 The combo of tart, sweet, and savory in this Pumpkin Bread Pudding is to.die.for.gooood! You will want seconds. and thirds. and if you’re like me you will find yourself eating dessert for breakfast. Or maybe that’s just my pregnant brain talking out loud… true story. When you make this treat—serve it to a crowd because you won’t be able to resist just once slice. Savor every last bite and share it with some friends so you can still fit into your holiday dress. Better yet, find a local a pregnant lady to deliver it to… with only three-ish weeks until D-day, I can’t fit into any of my clothes anyways. 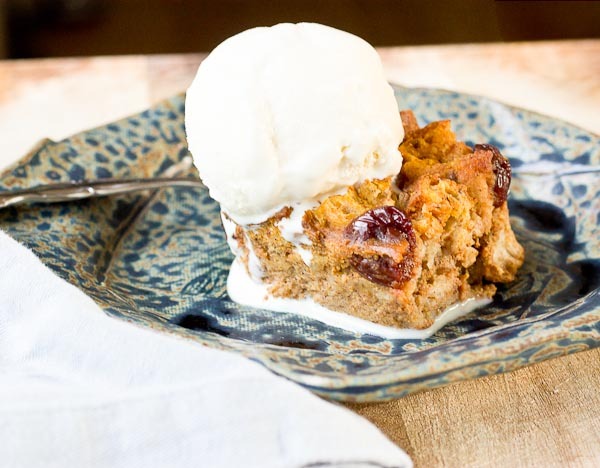 This Pumpkin Bread Pudding with Tart Cherries will warm up your home and fall spirit. Serve a warmed slice a la mode with a scoop of vanilla ice cream for extra decadence. You can thank me later. On large rimmed baking sheet, arrange bread cubes and bake for 10 minutes. Set aside. In large bowl, whisk together eggs, pumpkin puree, brown sugar, spices, vanilla, and almond milk. Spray 8X8 inch square glass pan with cooking spray and arrange bread in pan. Sprinkle dried tart cherries on top of bread. Pour pumpkin mixture over bread and firmly press down on bread pieces to soak in moisture. Allow bread to soak for 15 minutes. Bake bread pudding in preheated oven for 45 minutes or until pudding thickens and is no longer runny. 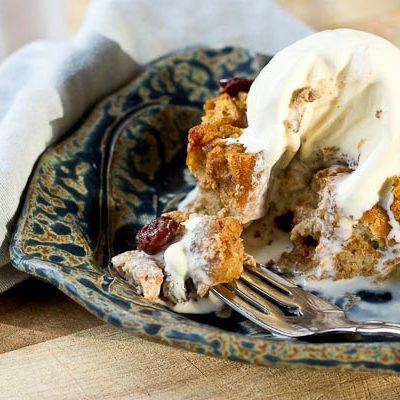 Allow to cool for 30 minutes; serve warmed pumpkin bread pudding a la mode with vanilla ice cream, if desired. I may or may not have had a bite or two for breakfast. 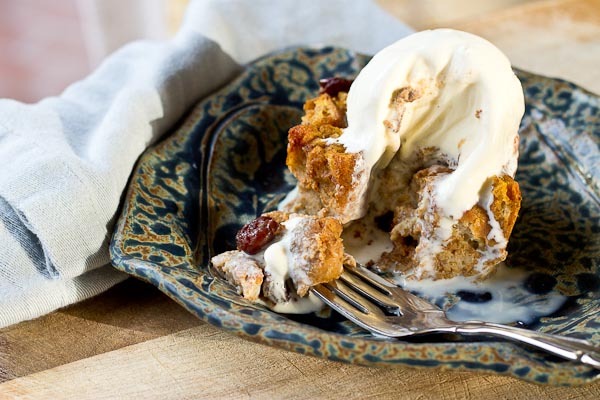 Bread pudding is one of my favourites! I love your addition of cherries here too. Thanks Rebecca 🙂 My hubs LOVES bread pudding too, so he introduced me to it… love the stuff. Omg, i need to make this! And i really shouldn’t have looked at this on Yom Kippur while fasting! Thanks babe– need to make you a GF version huh? It’s pretty insane right?! I can’t believe he’s almost here.. if only the weather would cool off so I can comfortably do some stroller runs with him.